If you haven’t heard of “Do Not Knock” laws yet, you will soon. And if you own or operate a business that does any door-to-door sales, you need to be aware of these local / municipal ordinances. In Massachusetts Haverhill, Methuen and most recently, Marlborough, among potentially others, have all passed ordinances that prohibit door-to-door sales to homeowners or renters on the Do Not Knock Registry. 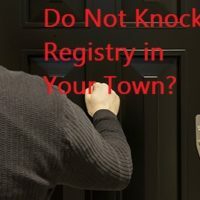 The Do Not Knock registry is akin to the National Do Not Call Registry – local homeowners and renters can submit their address to city or town officials or the local police department for inclusion on a list of homeowners who do not want to receive door-to-door solicitations. The prohibition on solicitations applies to salespersons, peddlers, and hawkers of goods or services whether they are individuals or representing a business. Placement on the list or registry often expires after a period of time requiring the homeowner or renter to re-submit their address. The Do Not Knock Registry is then provided to licensees (most towns require door-to-door salespeople, peddlers and hawkers to obtain a license from the municipality). Failure to comply with the Do Not Knock Registry results in a fine for each offense and/or revocation of the solicitation license, usually for 1 year. In other words, each home or apartment on the registry that is solicited will result in a fine and multiple violations will likely result in revocation of the license. for example, Methuen, Massachusetts has a 1 year expiration for inclusion on the Do Not Knock Registry. Thus, homeowners and renters needs to re-submit their address every year. Solicitors who violate the ordinance are subject to a $300 fine per offense and/or revocation of the license for a year. These ordinances are particularly troublesome for businesses in the solar-panel industry, landscaping, snow-removal, vinyl siding, and any other business that uses door-to-door sales to develop business. The more prevalent these laws become, the more likely homeowners and renters visited by these business’ sales representatives will be on the Do Not Knock Registry in that town. One interesting question is whether the wholesale violation of these ordinances could also constitute unfair and deceptive business practices in violation of Massachusetts General Laws chapter 93A. Violations of MGL ch. 93A allow the claimant to recover treble damages plus attorneys’ fees and costs. Although it may be difficult to identify the damages that could result from simply knocking on someone’s door – business owners should not underestimate the creativity of lawyers to find a way. These types of cases could also easily turn into class action lawsuits if the solicitor violated the ordinance for numerous local homeowners or renters. Bottom-line: any business that relies on door-to-door sales must: (1) first check state laws and local ordinances to determine whether they must be licensed (which is almost always the case) to solicit door-to-door, (2) check is there is a Do Not Knock Registry in that city or town and obtain a copy of the list, (3) distribute the Do Not Knock list to door-to-door salespersons employed or contracted by the business and (4) explain to those salespersons that they cannot solicit those residences. These businesses should also be aware of other applicable laws and regulations such as MGL ch. 93A Section 48 which allows a homeowner or renter to cancel any contract, for any reason or no reason, for goods or services over $25 within three (3) days after the sale.